If you buy a pre-cooked turkey. If you make stuffing from a box. If the gravy you crave comes from a jar. I judge you for none of it. You go on and love all up on yourself and do what makes Thanksgiving taste like Thanksgiving to you. Whatever makes you celebrate the heck out of this grand American tradition during which we do nothing but eat like a bunch of crazies is all right by me. But can I make one teeny, tiny suggestion? If you make nothing else from scratch whatsoever, go on and do something nice for yourself and your loved ones and adorn your plates with this cranberry sauce. And experience the sort of intense admiration that perhaps the inventor of that weird-but-iconic cornucopia thing experienced on a Thanksgiving long, long ago. 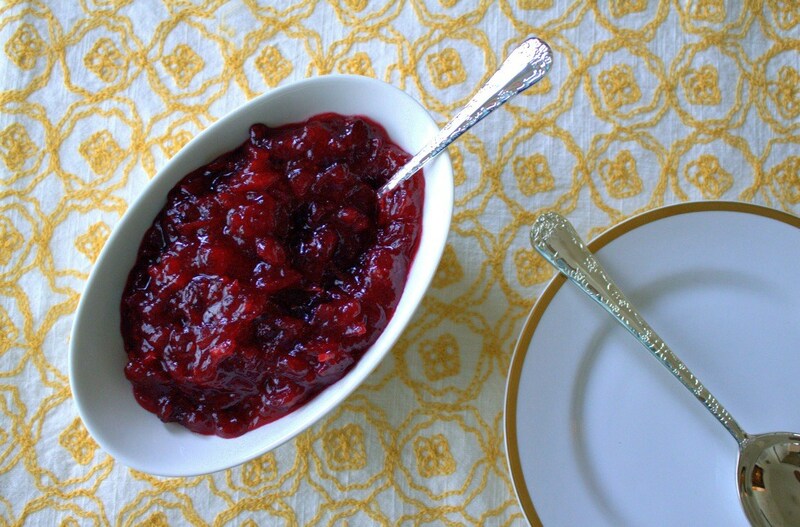 Think of a great homemade cranberry sauce as the crown jewel on a glorious meal of splendor. If you're the kind that slaves over the meal for weeks leading up to the actual holiday, clipping recipes months ahead of time, nuturing a bread starter in September, brining your heritage bird for days--then this ruby-red accoutrement is the sort of thing that just makes everything that much more magical. But if you're more of the type to make a few calls and leave the heavy lifting to the experts, whipping up a batch of this cranberry sauce is still the absolute right thing to do--elevating the meal to a home-cooked level, a jazzy and impressive little button that you can call your own. And really, what else do we yearn for with our holiday cooking and baking other than to be jazzy and impressive? Even better, the impressive jazziness of which I speak can be yours with mere minutes of prep time and less than 30 inactive minutes on the stovetop, save an occasional stir or two. Sweet-tart, bold with citrus and a good hit of brandy. The texture here is what I think makes it a real winner--it starts with fresh cranberries and finishes by folding in dried cranberries which plump a bit as the sauce cools, but maintain their character and intense, almost winey, cranberry flavor. 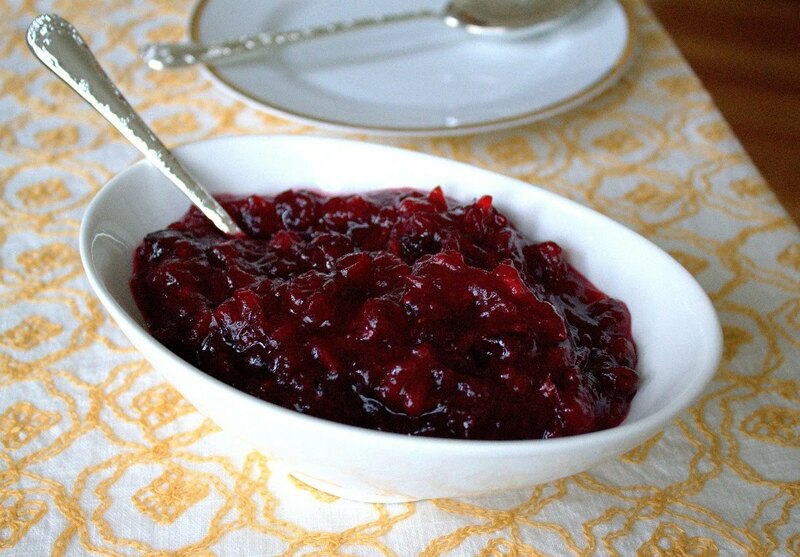 Double cranberry sauce. Double awesome. Happy Thanksgiving, everyone! Use a slightly bigger pot than you think you might need for this recipe--the bubbling can get quite intense and climb high up the sides of the pot in a flash. Adjust the heat as needed to keep it at a nice even simmer and not a fierce boil. I like to use organic citrus here since the entire fruit is zested. I make this sauce several days before Thanksgiving--it keeps great tightly covered and chilled, and tastes best when it has a few days to relax in the refrigerator. 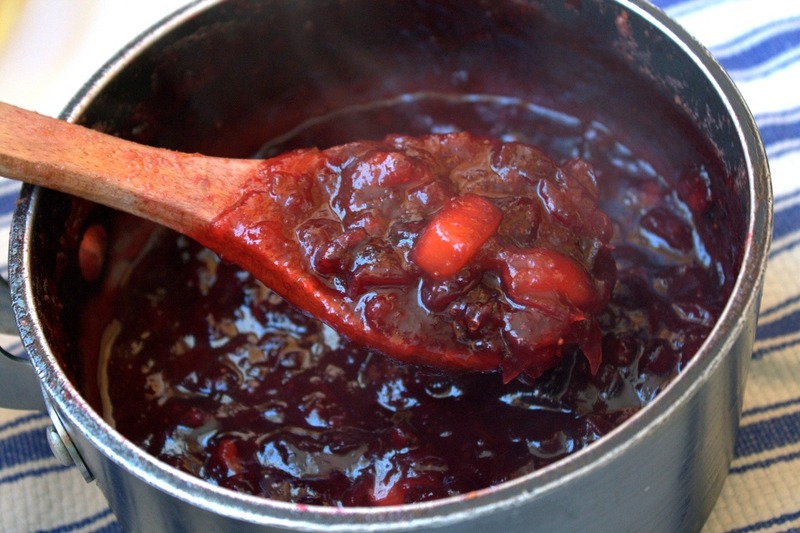 Place the cranberries in a large saucepan or other heavy-bottomed pot with the water and sugar. Stir and bring to a simmer over medium heat and cook until the cranberry skins begin to pop open, about 5-10 minutes. 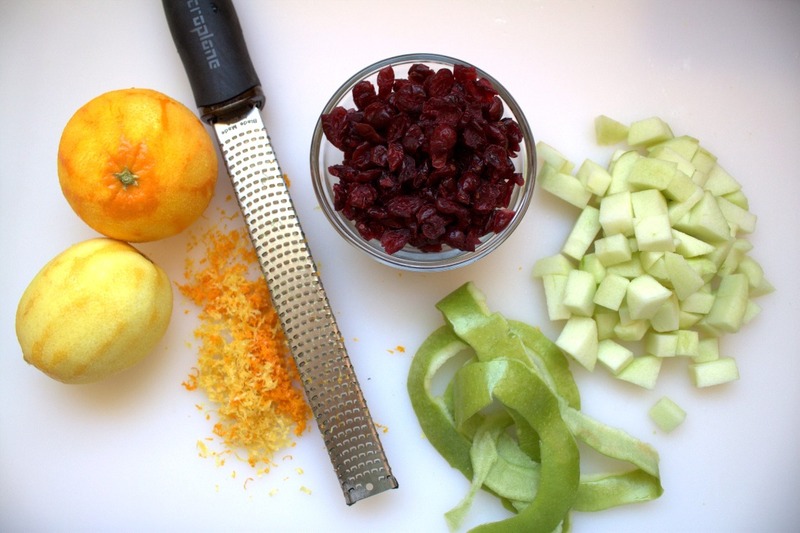 Stir in the diced apple, lemon and orange zests and juices, salt and brandy. Continue to simmer over medium heat until the mixture thickens and reduces slightly, stirring occasionally, about 15-20 minutes more. 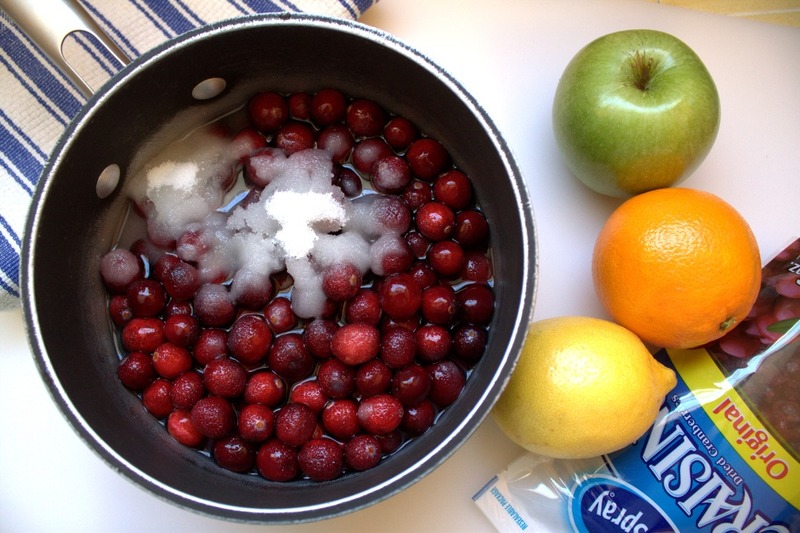 Remove the pan from the heat and stir in the dried cranberries. Transfer the sauce to a heatproof bowl or container and let cool a bit before covering and refrigerating, up to 1 week in advance. Serve slightly chilled.